Adi imagined Aaliya in his dreams and started blushing. Shagun came there and asked if he was okay as he was smiling on his own. She asked him if he wanted to share anything with her. He denied and said that he had nothing to share. Ismail came there, and Ishita hides on seeing him. Aslam told him that Ruhaan came there to meet him and also said about Sakina’s friend. Ismail asked Sakina to call her friend. Sakina went in to call ishita, but Ishita refused to come out and said that her husband was among those who kidnapped her. Sakina got shocked and said that she was lying. Ishita told her that she was not lying at all and asked her to help. Ishita asked her to trust her and help her to escape from there. Sakina agreed and gave Ishita her own dress. Ishita quickly changed her sari and ran for her life towards Raman’s car. Raman’s car was not starting. Ruhi asked him to take help from someone, and they got a mechanic nearby who helped them. He began his car but heard someone shouting his name. It was Ishita, but he did not saw her. Ishita was running after his car followed by goons. Ruhi asked Raman as why he stopped the car. Ruhi said him to start the car as she saw nobody calling him out. They left from there. The goons caught Ishita and called Anil and stated that they had got Ishita, Anil ordered them to kill her. Ishita saw a blade nearby when the goons were busy talking. She took that blade and tried to harm one go on and asked other to tie Ismail and the other goon. She took the van keys with her and started the van and left from there. Nidhi told the judge that Ishita was not missing, she was acting just to keep ruhi with the Bhalla family, but Romi scolded her and asked her to be in her limits. And asked the judge not to listen to Nidhi at all. Judge asked them to stop fighting and requested to wait for Ruhi. 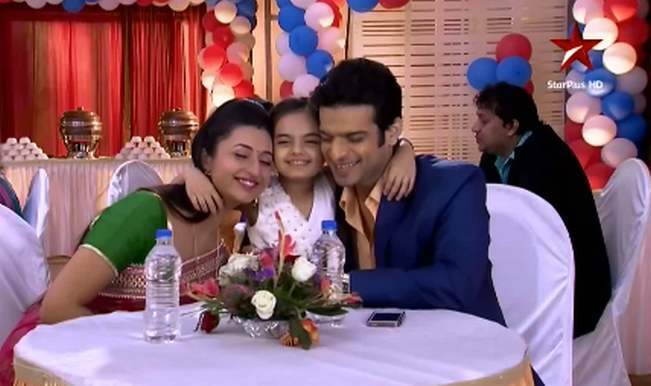 Raman and Ruhi came back home. Nidhi started again blaming Ishita and said to Ruhi that she missed her a lot. She asked her to come with her. Raman said to judge that he had a prove against Nidhi to prove that she had her hand in Ishita’s kidnapping. He showed to judge the video of Nidhi and Ashok. Ruhi and Nidhi was shocked to see her, she said that she wanted to kidnap Ruhi but kidnapped Ishita by mistake. Judge was shocked to hear that and said that she could never get Ruhi’s custody to such a woman and said that Ruhi would live with bhallas, Ishita too came there and requested Ruhi to stay with them.